BACON JAM...i know you've seen it. you say, "so what?!" i'll tell you what...IT'S DELICIOUS. that's what! i love it so much that it has become a staple in our house...a guaranteed little jar of sweet bacony goo will be in the fridge at all times. it goes with just about EVERYTHING! 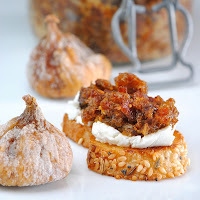 i have made Spicy Chipotle Bacon Jam a couple of times and the newest combo with dried apricots and Garam Masal...not posted yet...but this version with dried Kalamata (light skin) figs seems to be a crowd favorite. 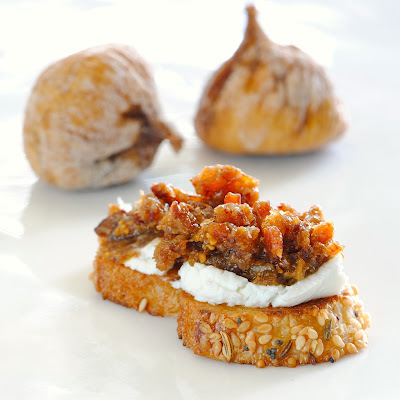 something about the snappy little fig seeds and the sticky spreadable texture. 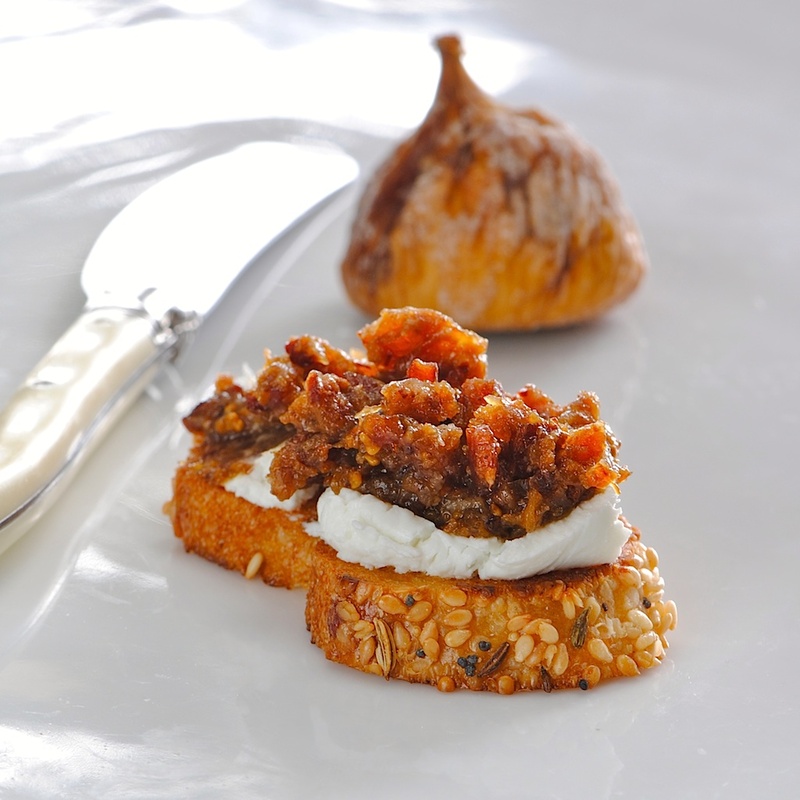 serve with a nice tangy goat cheese on a seeded baguette and you've got a fabulous appetizer. how about a waffle with maple syrup and a fried egg? a huge spoonful on a grilled burger with Havarti cheese? the jars will disappear before you know it and you'll soon make this a staple in your fridge as well. it's pretty darn easy, it makes the house smell delicious and you'll be a smash at the next dinner party if you bring a jar of this along....so go on...give it a try. 1 1/2 lbs sliced smoked bacon, cooked NOT CRISPY. i prefer to do this in the oven on a rimmed cookie sheet lined with tin foil. reserve 1-2 Tbsp fat for recipe and the rest for something else delicious...like Bacon Fat cookies perhaps. cook the bacon in the oven or a saute pan, until it is browned and most of the fat is rendered. reserve 1-2 Tbsp and try to get some of the yummy scrapings. cook onions and shallot in a saute pan with bacon fat until translucent. add vinegar, brown sugar, maple syrup, coffee, garam masala. bring to a boil and scrape up the bacon bits off the bottom if you have used that pan to cook the bacon. not too long...just until sugar has dissolved and everything is incorporated. add bacon (that has been cut or torn into 1 inch pieces) and diced apricots...stir to combine. transfer this mixture to a 5-6 qt. slow cooker and cook on HIGH, UNCOVERED for about 3 1/2 - 4 hours, until liquid is syrupy. transfer to a food processor and pulse until coarsely chopped...or to desired consistency. fill sterilized jars, let cool open to room temp, cover jars tight and refrigerate. this should keep in the fridge for at least 4 weeks. i have been known to open a fresh jar 5 weeks later and i'm not dead yet...as a matter of fact i'm working on one right now. 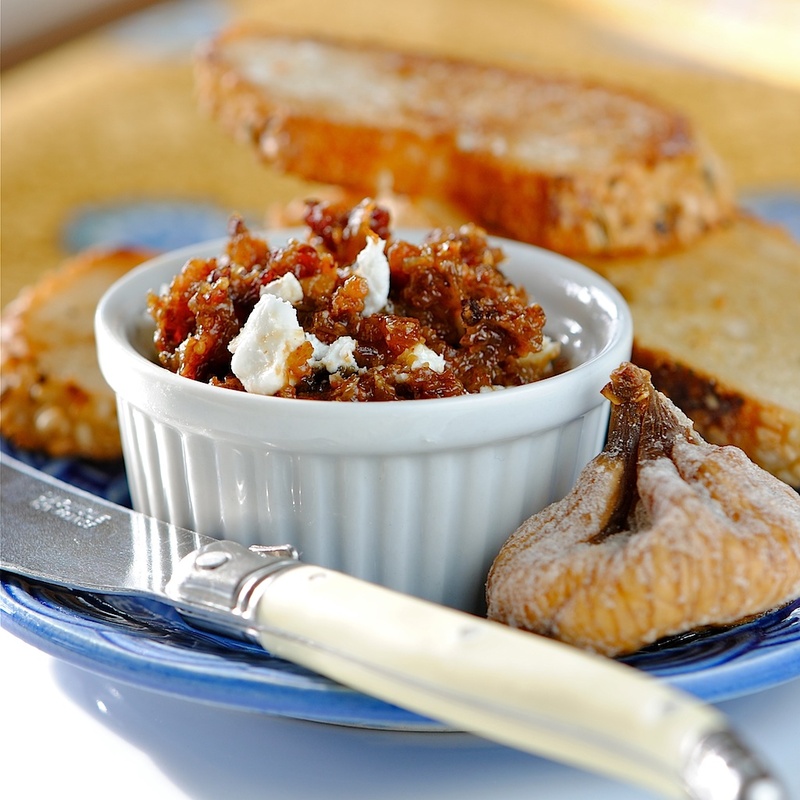 I have never made bacon jam but am very tempted to after hearing your endorsement. 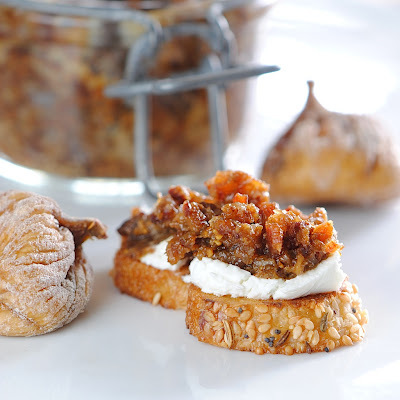 I love your addition of figs. Beautiful photos. I can almost taste it. I am a bacon jam junkie, and would like to try your version with figs. Do you mean kalmyra figs? I only know kalamata olives.....also you mention garam masala, but I don't see the measurements in your ingredient list. Thanks....I look forward to hearing from you! I always enjoy your recipes. the instructions say "garam masala", but they are not in the ingredient list. Should I use that or the chili powder? 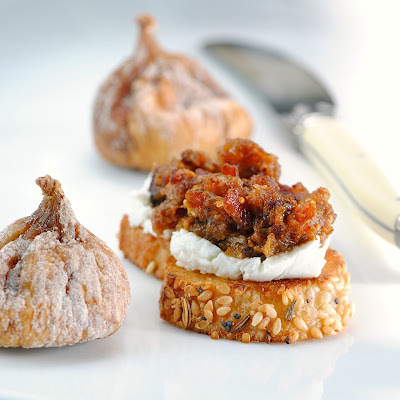 Also, you are correct, there is a fig from Turkey called "kalamata"! Hope to hear from you before I attempt the jam. hi stacy...hope i got you in time...well, of course i forgot to put it in the ingredients...my bad. i hope you have some. i fixed the post and i'm pretty sure i ended up using at least a teaspoon of garam masala. i probably started out with less, but added more after taste testing. use your taste test towards the end of cooking to see how much you would like. thanks so much for pointing that out and i hope everything works out great. The recipe instructions refer to dried apricots. I assume this should be figs instead?